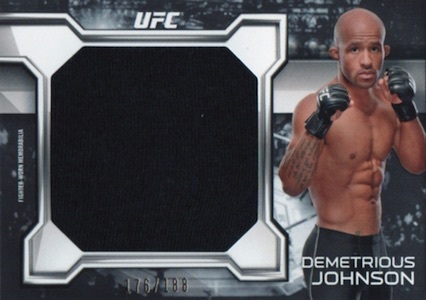 Featuring a new configuration compared to 2015, 2016 Topps UFC Knockout still focuses on the premium options. Each box promises eight hits, including four numbered autographs. 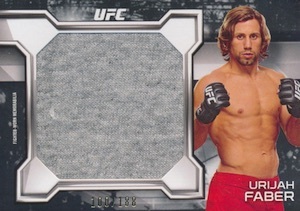 Celebrating the past, present and future of UFC, the base set checks in at 100 cards and also includes Silver (#'d), Gold (#/99), Red (#/8) and Mat (1/1) parallels. The key component of the release, autographs come in multiple forms. 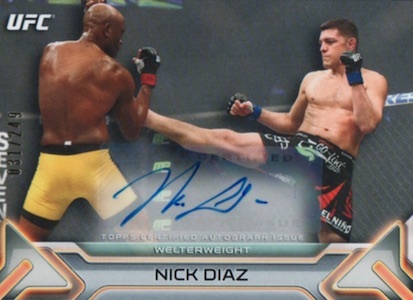 Knockout Autographs (#'d) feature over 40 subjects and first-time signers are noted on the card with a First Issue logo. Parallels include Red (#/8) and Mat (1/1). Offering red ink, Scarlet Signatures cover up to ten subjects and are numbered to 50. 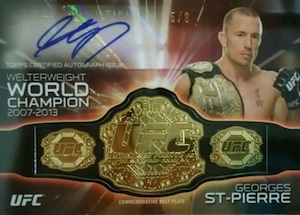 Featuring an ornate look, Museum Collection Framed Autographs include a metallic border for 20 fighters. Options include Silver (#/15), Gold (#/10) and Black Frame (#/5). 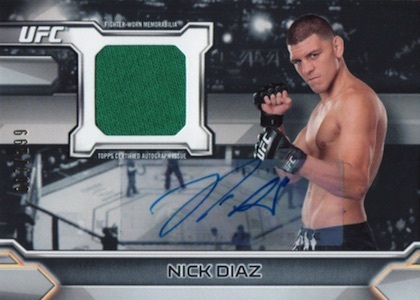 Pairing multiple signatures on the same card, Dominant Duos Dual Autographs (#/10) include two winning fighters from the same event, while Triumphant Trios Triple Autographs (#/10) up that number to three. 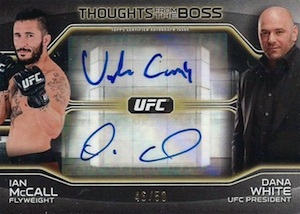 Adding autographs from UFC President, Dana White, Thoughts from the Boss Dual Autographs (#/50) also include signatures for 20 different fighters. 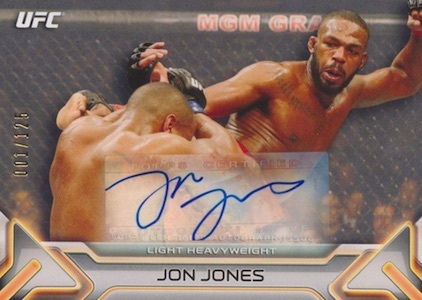 Pushing the total even higher, SixSigs (#/5) offer autographs for fighters that have a connection. 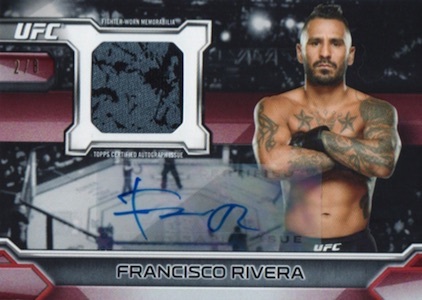 2016 Topps UFC Knockout Trading also features a variety of autographed relics. This includes Dominant Duos Dual Autographed Relics (#/5), Dual Autographed Fight Mat Relics (#/10), Championship Belt Plate Autographed Relics (#/8) and Scarlet Signatures Autographed Relics (#/10). Knockout Autographs (#'d) add 35 subjects, including both Red (#/8) and Mat (1/1) parallels. Museum Memorabilia is one of the rarest sets to chase, with a signed jumbo glove swatch. 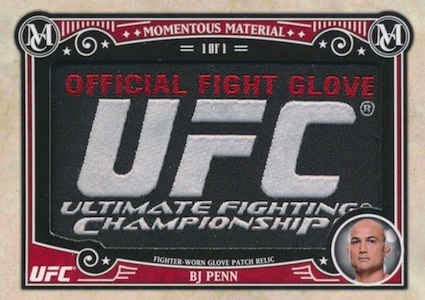 There are also Autographed UFC Glove Redemptions that can be exchanged for a signed full-size glove. On the memorabilia front, Momentous Material Jumbo Relics (#/25) include large fight-used mats and offer Ruby (#/8) and Emerald (1/1) parallels. One-of-one Momentous Material Glove Patch Relics feature wrist strap patches from a fighter-worn glove. Numbered to 188, Dominant Duos Dual Relics cover two fighters on the same card. Both numbered to 188, Knockout Relics include up to 25 figures with memorabilia swatches while Fight Mat Relics feature 15 subjects with event-used mat relics. Found for both relic inserts, Gold (#/88), Ruby (#/8) and Mat (1/1) parallels are available. Championship Belt Plate Mat Relics (#/50) include ten champions with a commemorative belt plate and event-used fight mat. Lastly, one-of-one Canvas Collection Originals offer hand-drawn options for top fighter. UPDATE: Collectors can also obtain limited posters and 5x7 cards for select 2016 Topps UFC Knockout cards exclusively though the Topps Online Store. 2016 UFC Knockout Robbie Lawler Dana White (#50 50) (BOSS) DUAL AUTO CARD!!! 49 cards. Serial Numbered #/249 or less. 31 cards. Serial Numbered #/350 or less. Good: Eight hits per box with four autographs, all hits numbered. Bad: Mostly sticker autographs, design does not feel high-end, signers list could be better. 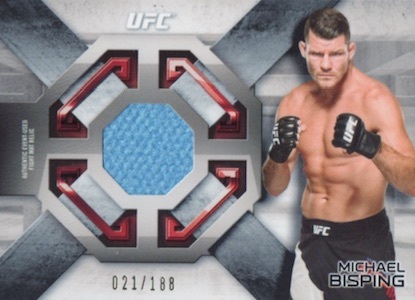 The Bottom Line: Despite being the premium UFC product, 2016 Topps UFC Knockout comes across more as a mid-level or low-end release that just happens to have two hits in every pack. While numbered hits are always nice, the transition to only sticker autographs is painful at this price point. 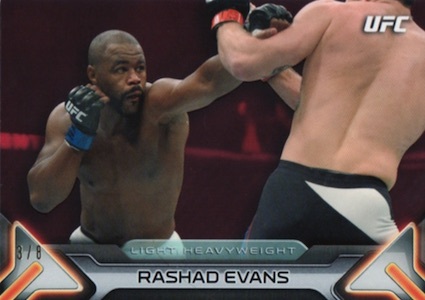 The main design in 2016 Topps UFC Knockout is fine. The problem is that this is supposed to be the marquee UFC set. On the plus side, the image quality is good and subjects pop, but the border and design is unimpressive and I feel the orange glow makes it look cheap. At least throw some foil in the mix or some other quality element. As has been the issue in the past, parallels are fairly hard to spot as they only change the background haze color. I don’t really see what this adds other than a numbered base card option. Hits are fairly generic with a lot of base autograph parallels, tiny mat relics, one-color jumbo relics, and auto relic combos that pair a small swatch with a sticker autograph. While most of the relics are ambiguous about the origin, the mat relics at least note the specific event of use. Normally a standout, even the Museum Collection inserts feature sticker autographs this year, greatly weakening the appeal. Compounding that is the fact that many of the base fighter autographs were signed on-card last year and are stickers this year. 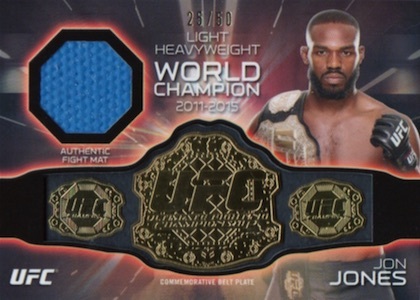 For me, the only hit that really caught my eye was the Jon Jones Championship Belt Plate Relics. First off, I am generally not a fan of manufactured relics as they are mostly filler in my eyes and should not be even considered relics or count as "hits." Having said that, belts have a special place for the fighting sports like wrestling, boxing, and MMA and this ties in perfectly with that. 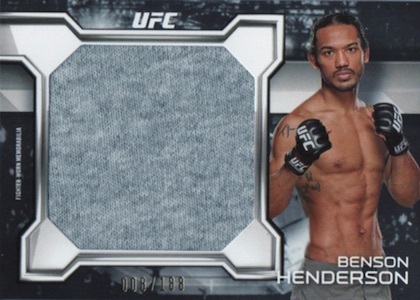 Adding to the appeal for me is the included fight mat relic from UFC 159 where Jones successfully defended his title. This further draws the connection and significance. Obviously, this is not a new concept as several UFC and WWE releases have already included similar options, but still very cool to see one up close. 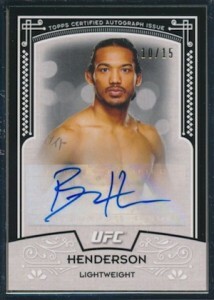 The UFC is quite large in scope at this point but the autograph checklist does not really reflect that. Sure, the top-tier names like Rousey, Liddell, McGregor and Jones are all there, but it seems like many of the same fighters are featured in every set and quite a few in Knockout have questionable relevance. With limited UFC sets each year, it would nice to have a more varied checklist for each release. When you take out things like on-card autographs and don’t replace it in another form, the value suffers. At $150+ per box, only the very elite fighters or one-of-one relics offer any notable value and those are tough to come by. This is a gamble that most collectors won’t win. I was largely underwhelmed by 2016 Topps UFC Knockout. Even with eight hits, it was bland and one-note. The only thing that saved this specific experience was the belt relic. It is certainly not enough to change my views on the product as a whole, but it made my box-opening experience more enjoyable. 2016 Topps UFC Knockout Aljamain Sterling Dana White Dual Auto 47 50! What the hell are you doing Topps? 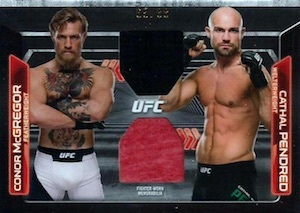 This is product is supposed to be the marquee UFC product of the year and yet it’s filled with stickers?!? Even the Scarlet Sigs and Museum are stickers.. Every year this product has declined with 2013 being the best in variety and hit value..
Every year we could count on 1 maybe 2 hard signed cards per box but now they look like the only ones that are hard signed are the 1/1 gloves (of course I did not get one). Topps has found a way to devalue and cheapen this product tremendously. Its the same price point as last year with 2 less hits. Most of the hits are not much different than the cheaper products like “champions”. Is it just me or do the mat relics seem to shrink every year? You have 750 sq ft of mat to make stuff out of yet all you get it a tiny 1″ across swatch. You gotta be kidding me. Martin Kampmann has not fought since 2013 and has retired. There are not many “rookies” in this set at all. Instead, lots of sticker mediocrity. The hit list looks like the champions hit list. 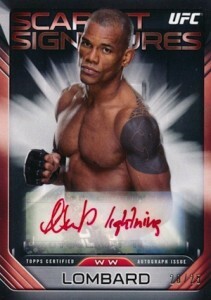 It seems like topps is not putting any effort into this or does not know anything about the UFC. I am not a fan of this years product at all!! UFC products used to be a great value but now I don’t see the value at all at the intro price point..
Would’ve called this average, but for it’s price point I couldn’t. My experience with this is joining a half case divisional break. I purchased half the divisions, with average luck I would get half the cards, so I thought. Of the 24 autos, I got 8, exactly half the autos were female fighters which I did not buy into. Every hit by odds on the packs were there in the six boxes, and absolutely nothing that made anyone in the break even say wow. I’ll get what I need from this set from eBay, as it seems no one is impressed and the cards can be found for far less than buying any more boxes or joining any breaks. For $150 less than I spent on break I could’ve purchased on eBay the exact same cards. Yeah, this product is definitely below average.